Sen. Mazie Hirono (D-HI) believes men have no say in the accusations against Supreme Court nominee Brett Kavanaugh. A woman named Christine Blasey Ford alleges that he sexually assaulted her in high school. She was invited to testify before the Senate Judiciary Committee but has yet to accept the invite. Some Republican lawmakers have told the press that if Ford fails to show up, they will move to proceed with Kavanaugh's nomination. Others have suggested that Ford may be confused about her story and has gotten her facts "mixed up." Hirono has heard enough. She said her male colleagues - and all men in general - need to "shut up" about the Kavanaugh controversy. 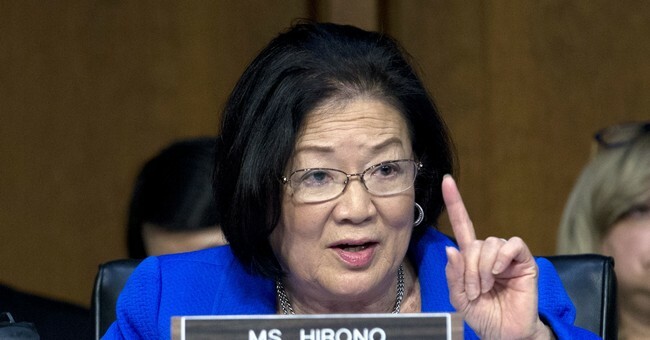 In an interview with Politico Magazine, Hirono revealed that the Democrats have a mind to keep the empty Supreme Court seat vacant for two years, when they can hopefully get a Democrat in the White House. Ford's lawyers sent Chairman Chuck Grassley a letter explaining why their client has not agreed to testify. They allege that the committee is making her sit at the same table as Kavanaugh and that the senators already have their mind made up about her. They also want an FBI investigation before offering a testimony. But, Grassley said the hearing will proceed as planned, whether she shows up or not. President Trump did not take Hirono's advice and weighed in on the media reports Wednesday morning. He said Ford deserves to be heard and it would be "unfortunate" if she didn't show up. But, he also commended his nominee and said that Kavanaugh has an "unblemished record."